More and more people are living with roommates later in life to save money, live closer to the urban core, and even just because they would prefer not to live alone. But how do you know if someone will make a good roommate? More and more people are living with roommates later in life to save money, live closer to the urban core, and even just because they would prefer not to live alone. But how do you know who will make a good roommate? Some people prefer to know the person they’re moving in with, and only consider friends, family members, or acquaintances as potential roommates, while others prefer to search outside their immediate circles. Regardless of whether you plan to live with a childhood friend or someone you met through a roommate-finding app, having the following conversations should help you to figure out if you and a potential roommate are a good match. 1. Will you both be on the lease? Whether or not you are both on the Lease Agreement may be determined by your unique situation. In many instances, one person already resides in the property and is looking for a roommate. While you should let your landlord know when someone else moves in, they won’t always require you to add the newcomer to your lease. On the other hand, if you’re both moving into the rental unit at the same time, you will likely both be required to sign a lease with your landlord. Regardless of whether both roommates are on the lease, it’s a good idea to create a Roommate Agreement. A lease only addresses the landlord-tenant relationship, so you should have a contract with your roommate to outline house rules (e.g. no smoking indoors) as well as individual duties and expectations (such as cleaning and respecting quiet hours). 2. Are you looking to rent long term? Let’s say you are moving in with a friend. Before signing a lease, you should find out how long they envision renting together. If they prefer a short-term arrangement, while you hope to settle down for the foreseeable future, you may decide that you aren’t a great fit for each other. Alternatively, you could choose to be the sole party on the lease and arrange for your friend to pay you rent. Before moving in together, do your best to figure out if you will get along. Are you both introverts who prefer to stay at home and watch TV, or is one of you more outgoing? Are you both social butterflies? Regardless of your personalities, you should negotiate terms that will allow both of you to enjoy your new living space (e.g. taking turns having friends over if you both like entertaining or asking the quieter roommate if it’s all right to host a get-together). 4. Do you expect to be friends? Do you want to live completely separately, or as friends who spend time together in the evenings and on weekends? Do you want to eat meals together or apart? Of course, your interactions may be limited by scheduling. Perhaps one of you has three jobs, in which case eating together, let alone being home at the same time, could be a rare occurrence. Discuss your schedules and lay out your ideal living arrangement so that you both understand what the other wants. 5. How will rent, bills, and other monthly expenses be divided? It’s crucial that you both have a steady stream of income that will cover all of your expenses, including rent, tenant insurance (required by some landlords), utilities, cable, internet, and groceries. Be honest about your financial situation to prevent any unpleasant surprises after the lease is signed. Next, how will you split expenses? Most roommates split costs down the middle, but how will you go about it? Will one roommate’s name be on all bills, or will both your names be listed? Who is responsible for any late charges? When it comes to buying household items, some roommates go grocery shopping together, while others tally their receipts at the end of the month. It makes sense to share the cost of cleaning supplies and things that you both use such as toilet paper and light bulbs, so consider taking turns purchasing those items. 6. What is considered shared property? If you’ve lived independently before, chances are that you have your own furniture and appliances, in addition to personal possessions like books, paintings, and collectibles. Your possessions will likely get mixed together with those of your roommate, so it’s a good practice to inventory your respective belongings before combining them. You may have different ideas about sharing, so be sure to clarify how your roommate feels about you using or borrowing their things. Furthermore, you should discuss how items purchased and shared will be divided when one of you moves out. If you split the cost of a new toaster, who gets to keep it when you part ways? 7. How will you use common areas? 8. How do you feel about guests? Overnight guests can also drive a wedge between roommates. Do you need inform your roommate if someone stays overnight? If one of you has a significant other, how often will they be sleeping over? If they are staying over multiple nights per week, are they expected to contribute to utilities or help with chores? 9. How will chores be divided? Cleaning can be another issue of contention between roommates, so try to anticipate any problems before moving in, particularly if one of you is more of a neat freak. You should both be expected to clean up any cooking messes and generally tidy up after yourselves, but what about ongoing chores like vacuuming, dusting, and household laundry? While some roommates thrive on a detailed cleaning schedule that divides chores evenly, you and your roommate may prefer a more casual cleaning agenda. Regardless of what you prefer, it’s important to discuss expectations before you move in together, particularly if pets are involved. 10. Do you have pets? 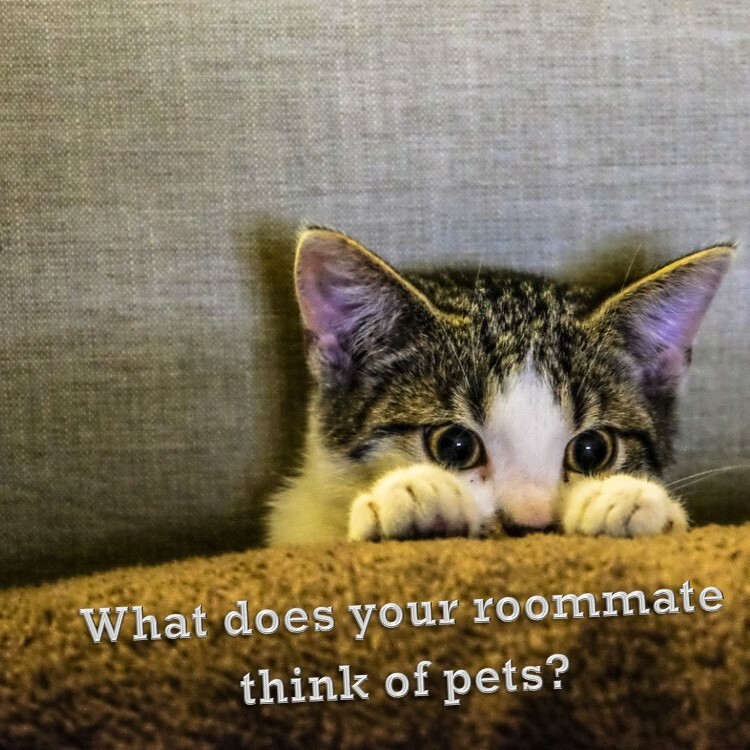 Even if the building and your landlord allow pets, how does your potential roommate feel about them? If they have allergies or don’t like animals, while you are a devoted pet owner, you may not be a good match. Even if your roommate is fine with pets, it’s a good idea for them to meet your cator dog before move-in day to see if they’ll be able to live together. More importantly, you should decide ahead of time whether your roommate will share any responsibility for the pet’s care (feeding, grooming, walking, etc.) and whether you are solely responsible for any damages it causes. There are benefits to having a roommate that go beyond saving money, from fewer chores to more homecooked meals. Many people like the company of a roommate and the added security of living with someone. So long as you have a solid Roommate Agreement, respect each other, and communicate effectively, there’s no reason why your living arrangement shouldn’t thrive and even lead to a lifelong friendship. Renting with Roommates: What are Your Lease Options?